We’d Love to Hear from You at our Kelso Location! Health for Life Spinal Wellness Centre in Kelso can be found on Bridge Street, adjacent to the historic Kelso Abbey. 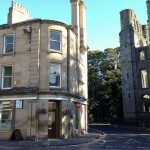 We are just one minute’s walk from the central square of Kelso. You’ll find plenty of convenient free parking throughout the town. We are located on the ground floor and our reception area and treatment room are wheelchair accessible. Please note that the toilet is located on the ground floor, however it is not wheelchair accessible. Please contact us if you have any enquiries about accessibility, including accommodation for sight or hearing impaired persons.